Blue Forest’s tree house was very well received at RHS Chelsea Flower 2017 winning 4 Gold Stars from the RHS judges. The tree house made from Kebony, a beautiful wood recommended by leading architects, offered the public a rare opportunity to experience the quality and charm of Blue Forest’s bespoke tree house creations. Located on the show’s prestigious Main Avenue, the stand featured a natural woodland planting scheme designed by Architectural Plants, a prestigious nursery with an enthusiasm for the sculptural qualities of trees and quirky or unusual plants. 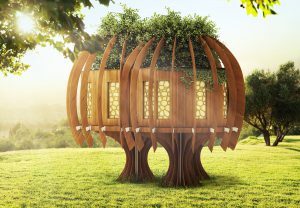 Finished with premium grade Cedar cladding and featuring a copper turret, the Blue Forest tree house was designed as a fairy-tale garden hideaway. The tree house has plenty of space inside for the family to entertain friends or relax with a book in the comfy window seat. Those with an eye for detail will have spotted numerous other bespoke touches including copper finials, intricate rope work and a bespoke interior design scheme. The woodland planting scheme surrounding the tree house was set against sustainable Kebony timber decking and cladding, which was chosen for its beauty, environmental credentials and hardwearing characteristics. Two giant tree creatures also made an appearance at the Chelsea Flower Show guiding people to their home in Blue Forest’s magical, fairy-tale tree house.